I've fallen in love again...with Tarte Tatin. It's not surprising that Tarte Tatin, one of the quintessential French desserts, is so celebrated. Any dessert that combines buttery, sticky, caramelized fruit nestled in a cushion of buttery, golden, flaky pastry (and hopefully topped with vanilla bean ice cream) deserves to be worshiped. Each rich mouthful of Tarte Tatin it is sheer, unadulterated bliss. it could have been prettier, but it was so good we didn't care! 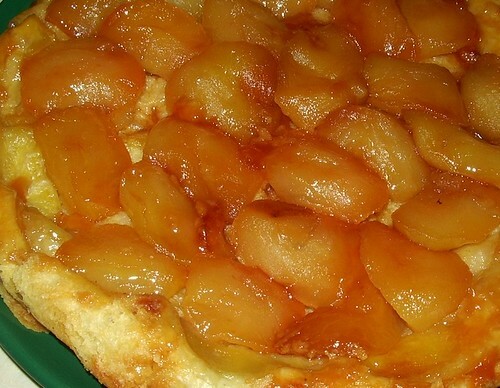 Want to know another great thing about Tarte Tatin? It is dead easy to make. Roll the thawed puff pastry sheet out on a floured work surface with a floured rolling pin. Cut out a 10-inch circle of pastry with a sharp knife, using a plate as a guide. Transfer the pastry round to a baking sheet and chill. Spread butter thickly on the bottom and sides of your skillet and pour sugar evenly over the bottom. Arrange as many apples as will fit in the pan, packing them tightly in concentric circles. Cook apples over medium to medium-high heat until juices are deep golden and bubbling and the apples are golden and cooked through. The caramel might be unevenly colored at first, don't worry. And make sure they aren't burning! I often need to turn the apples a few times to create an even, golden color. Either transfer the apples and caramel to a ceramic pie dish or leave them in the oven proof skillet and lay the pastry round over the apples, tucking the edges down around the apples. Watch your fingers, caramel is HOT! If using homemade pastry, roll the pastry dough to a round just larger than the mold. Wrap the dough around the rolling pin and transfer it to cover the apples. 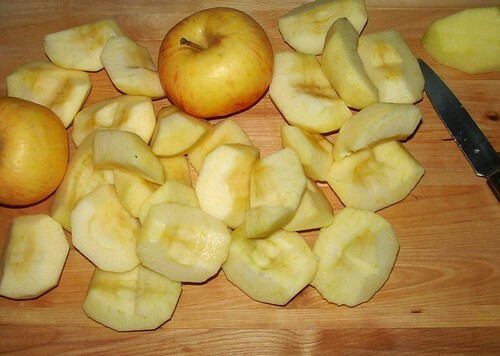 Tuck the edges down around the apples, working quickly so their warmth does not melt the dough. Bake until the pastry is browned, about 20 to 25 minutes. Transfer skillet or baking dish to a cooling rack and cool at least 10 minutes. Invert a platter with a lip to catch any juice over the skillet and, using potholders to hold the skillet and plate tightly together, swiftly invert the tart onto the platter. 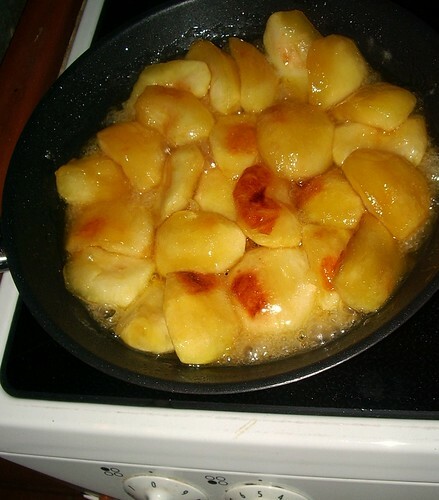 Replace any apples that stick to the skillet and brush any excess caramel from the skillet over the apples. With vanilla bean ice cream if you're feeling extra naughty. *If the urge strikes to make my own pastry, (which isn't often) I use a recipe from From My Château Kitchen by Ann Willian. Sift the flour onto the work surface and make a well in the center. Put the egg yolks, salt and water in the well. Pound the butter with a rolling pin to soften it, add it to the other ingredients in the well, and work them with the fingers of one hand until thoroughly mixed. Using a pastry scraper, gradually draw in the flour from the sides and continue working with the fingers of both hands until coarse crumbs are formed. If the crumbs seem dry, sprinkle with another tablespoon of water, it should be soft but not sticky. Press the dough together into a ball, but don't overwork it; the dough will be uneven and unblended at this point. Blend the dough quickly so the butter doesn't become too warm. Put the dough in front of you and use the heel of one hand to push away a bit at a time and flatten it against the work surface; this flattening motion evenly blends the butter with the other ingredients without overworking the dough. When the entire ball of dough has been blended in this fashion, gather it up with a scraper into a rough ball, and repeat this process of blending with the heel of your hand until the dough is pliable and pulls away from the work surface in one piece, 1 to 2 minutes. Shape it into a ball, wrap in plastic, and chill until firm, at least 30 minutes. Walt's recipe is also excellent. Tarte Tatin. What better way to celebrate apple season? sweet! i have added this to my favorite file and will be trying it out as soon as possible. thanks for posting it! yum, I love Tarte Tatin too! I used to make it like you do, in a frying pan first, and then tipping the apples into a tart tin, but now I have a heavy non-stick skillet with a detachable handle which wasn't very expensive (from Carrefour I think). It works really well and means turning the tatin out is never a problem. Funny how so many people are scared of it; it really is easy to make. The only thing you have to be brave about is getting the apples really brown without burning them. Definitely perfect to get apple season started! I don't have a proper pan either, and end up doing the same. I love tarte tatin! It works really nice with pears or adding some berries to the apple. Yummy, yummy! We had leftover Tarte Tatin for breakfast last week. It was divine! You're welcome! Please let me know how it turns out. It is surprisingly easy to make. The apples go brown quickly on my stove, so I have to really watch them. I'll have to look for a pan like that. Sounds interesting. I made it with pears once years ago. It was really, really delicious! Must try it again. I also have a recipe that uses quince that I want to try this autumn. These fab recipes just always leaving me drooling just like the smell of your crumbles..... yum!! I'll make the crumble for you when I come to visit in Brittany. We'll have some cider with it. I found your blog through Kate Hill's, while searching for a recipe for cassoulet. I've been living in the Drôme for the last 6 months now; the leaves on the grapevines are turning red and farmers are selling their apples by the kilo along the road. I'll have to try your recipe soon. I'll be returning to the U.S. sometime next year, but I know I'd love to live here if not permanently then half the year. It's great being in the countryside! Kate has the best recipe for Cassoulet. You must try it! I don't know the Drôme but have heard that it is very beautiful. How wonderful that you have had the chance to live in France for half a year. What brought you here, if I may ask? Ooooh, looks great! I have a red Le Creuset tarte tatin pan and have yet to use it for that purpose! It's been great for quiche and clafouti but it's time it experiences what it was born for! Oh, I am jealous of your le Creuset tatin pan! I've always longed for one of those. Maybe sometime to ask Santa for?? I can highly recommend it. Actually, I don't think quiches and pies can do without it! It does wonders for pastry! Yes, that is a great idea! Merci.